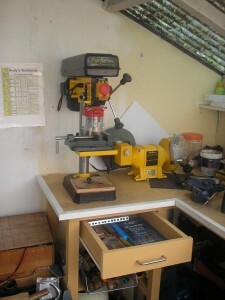 Back in March I built a bench/cupboard to support my pillar drill. This has been working fine but my selection of drills keeps getting covered in swarf, oil, saw dust or whatever I happen to be working on. 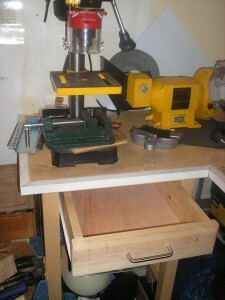 For this reason I decided to build a drawer to go under the drill to store all these items. I started with some 20mm planks, a handle and some metal drawer runners which were purchased at a selection of DIY stores near to home/work. 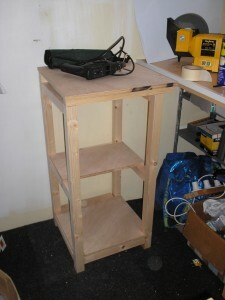 I already had some 6mm ply for the base but realised that I was going to need a slot in the wood. I contemplated building a small fixed sized plough plane but realised that it probably wasn’t that simple to make one that works. 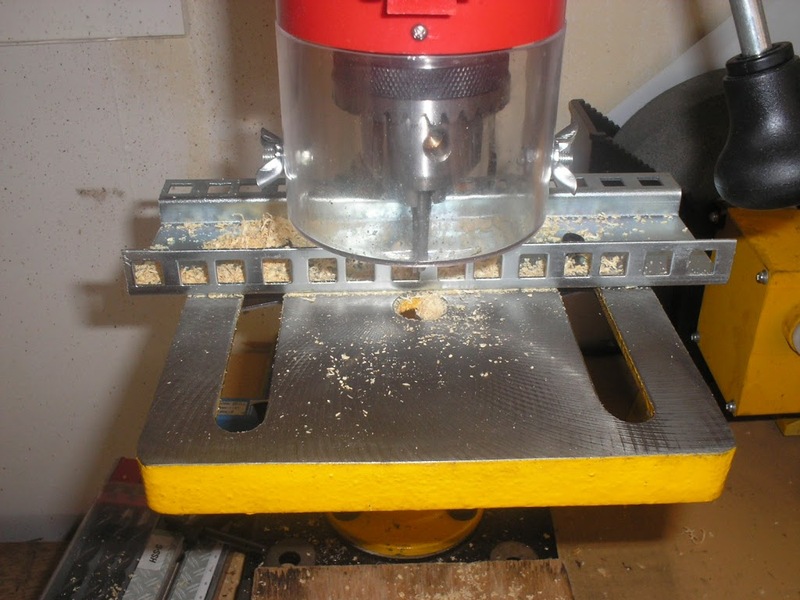 I knew that routers were going to be expensive so I compromised on buying a 6.5mm routing bit. 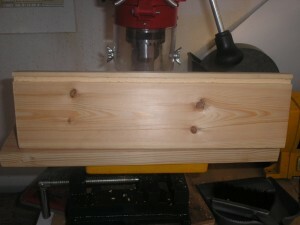 I mounted this in the pillar drill and added a “fence” to the back so that I could run the wood from right to left. After a few practices I managed to get some reasonable slots. 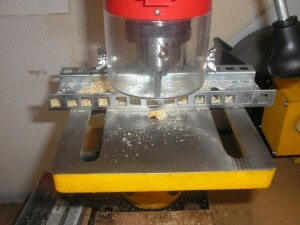 If I was going to make a lot of these I’d bolt the pillar drill to the bench as it moved a little during this process. I’d also have two fences to control the position of the wood and hence the position of the slot as the wood had a tendency to wander. 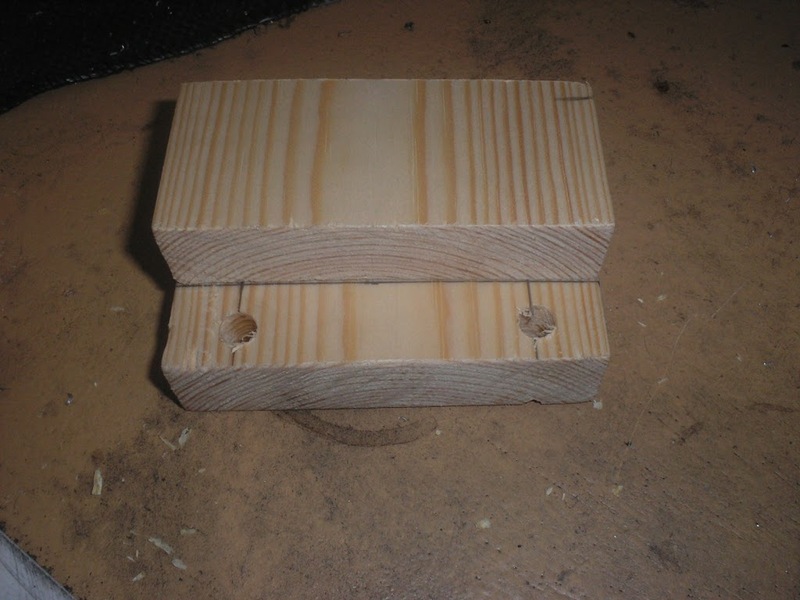 I then built a drilling jig for the pegs. 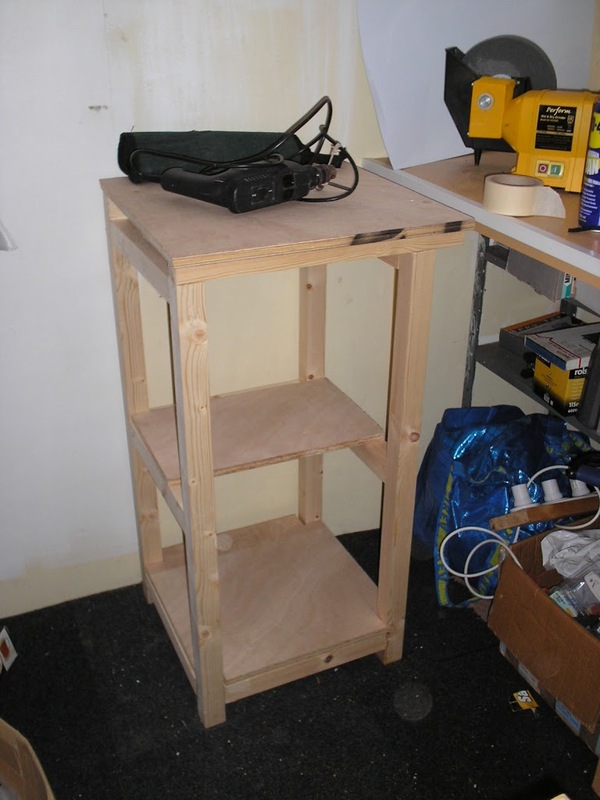 I made a slight error here in that I forgot to allow for the position of the slots when making this. Luckily although the pegs holes and slots were very close they did not clash. 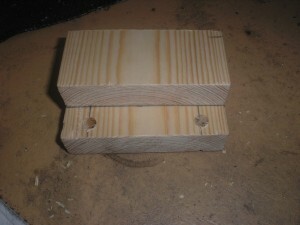 The jig was clamped on the ends of the two sides and the holes were drilled. The jig was just held in place to make the holes in the front and back. The bottom was cut from the ply and the drawer was roughly assembled with the runners simply glued on. The front needed to be planed down a little but otherwise I had a workable drawer at this point. Three coats of exterior varnish for the base and a couple of coats of my favourite garage floor paint for the sides, some glue on the pegs and the whole thing re-assembled and I had a working drawer. I lined the bottom of the drawer with some antirust paper and filled it with my selection of drills and taps. At somepoint I’ll build some trays or dividers to stop things rolling about but it’s good for now and allows me to keep the bench swarf free without much effort. Handy Andy… The drill table looks great! I’m impressed. Rather than making boxes for the drawer I found these Molgar boxes in the Ikea bathroom section.